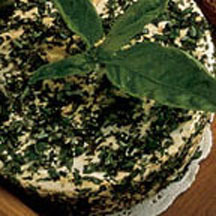 Use a mixture of your favorite fresh herbs to coat a wheel of brie. Chop mixed herbs Gently press onto the moistened surface of the Brie. Wrap and chill until ready to serve. Serve with butter or water crackers.